For most of three decades, Drew Pearson was the most familiar journalist in the United States. In his daily newspaper column—the most widely syndicated in the nation—and on radio and television broadcasts, he chronicled the political and public policy news of the nation. Unfortunately, due to sales rights restrictions, we cannot offer Washington Merry-Go-Round for sale in your country. For most of three decades, Drew Pearson was the most familiar journalist in the United States. In his daily newspaper column—the most widely syndicated in the nation—and on radio and television broadcasts, he chronicled the political and public policy news of the nation. Meanwhile, he also worked his way into the inner circles of policy makers in the White House and Congress, lobbying for issues he believed would promote better government and world peace. Pearson, however, still found time to record his thoughts and observations in his personal diary. Published here for the first time, Washington Merry-Go-Round presents Pearson’s private impressions on life inside the Beltway. Pearson held the confidence of presidents—especially Lyndon B. Johnson—congressional leaders, media moguls, political insiders, and dozens of otherwise unknown sources of information. 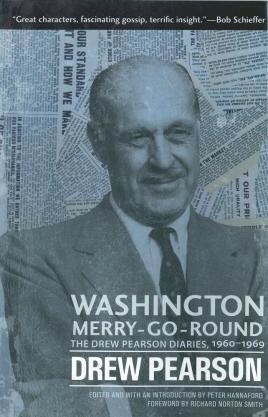 His direct interactions with the DC glitterati, including Bobby Kennedy and Douglas MacArthur, are featured throughout his diary, drawing the reader into the compelling political intrigues of 1960s Washington and providing the mysterious backstory on the famous and the notorious of the era.